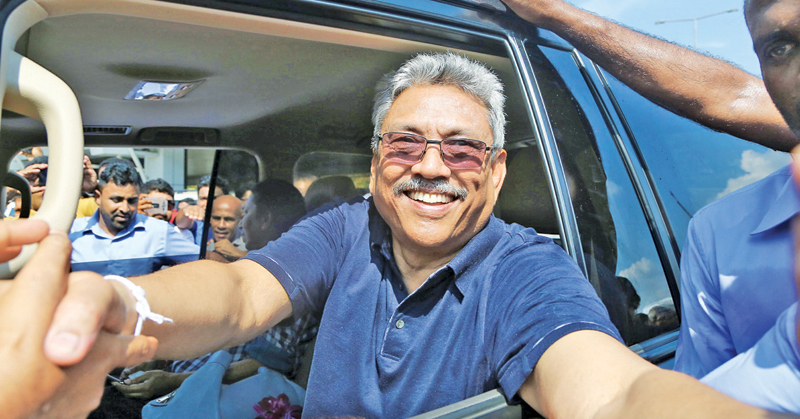 Former Defence Secretary Gotabhaya Rajapaksa arrived in the country yesterday having concluded his trip to the US to renounce his US citizenship. Gotabhaya Rajapaksa returned after a three-week personal visit to the US. Two lawsuits were filed against him at a US court during this time. He said the media after his arrival that the lawsuits had been filed against him and that his lawyers in the US are in working on having these two lawsuits dismissed. Two cases have been filed in the United States courts against Gotabhaya by the daughter of slain editor Lasantha Wickremetunge and a Tamil torture survivor. After his arrival last morning, Rajapaksa said that these lawsuits have been filed targeting the upcoming elections. He said they were baseless and such actions will only motivate him and his supporters even further to pursue political change in Sri Lanka.